Never thought of the time-sink grocery shopping can be. I like your ideas to streamline things a bit. We mapped the store by aisle, and we mapped our kitchen by what we expect to have in each location and how much of it there should be. The one thing we can’t get done is getting the store people to bag by those locations == we’d have to bag ourselves to do that. Its a trick just getting them to put the cold stuff together. 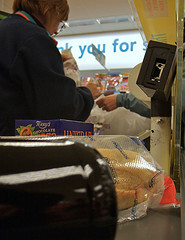 Yep, like bill said, the store employees never bag my things the way I put them on the conveyor belt! These are all great ideas, though! Thanks, Elliott!